A project to reintroduce the great bustard to the UK has been given a £1.8m boost from the European Union. The world's heaviest flying bird was hunted to extinction in the UK in 1832. It was reintroduced to Salisbury Plain in Wiltshire in 2004. A population of around 18 has been established from chicks brought from Russia. The cash will cover 75% of the scheme's costs, including monitoring the birds with GPS satellite transmitters. The Great Bustard Consortium was founded in 2004 to reintroduce the birds. It is made up of the Great Bustard Group, the University of Bath, the Royal Society for the Protection of Birds and Natural England. The group is embarking on a five-year project, funded by an EU Life+ grant. 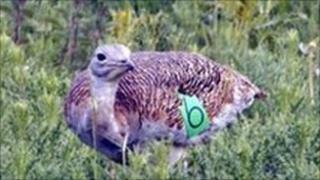 In 2009, the first great bustard chicks in 177 years hatched in the wild in the UK. Last year, at least four chicks hatched and two native chicks were successfully reared to fledging. Male great bustards can reach more than 1m tall (40in) with a wingspan of up to 2.4m (7ft 10in). A University of Bath spokesman said 16 bustards had been fitted with satellite transmitters to track where they feed and roost. The areas will be monitored for the availability of food, and for predators. Feeding patches with the right plants and seeds to provide food and attract the type of insects the birds eat will also be cultivated. David Waters, founder and director of the Great Bustard Group, said: "Despite our successes over the last six years, we would sometimes struggle to find £10 or £20 to put diesel in the Land Rover; now we have a chance to give this project real wings. "The funding will provide a properly resourced project, with four new posts, new monitoring equipment and even the possibility of a second release site." The project's partners will still have to find 25% of the costs. Bath PhD student John Burnside said: "We're particularly interested in how the birds will behave in their new habitat. "Great bustards learn a lot of their behaviour from each other and so the newly introduced chicks have to learn quickly how to feed, survive and avoid predators without the help of their mother. "As the population becomes established, their survival chances should hopefully get better - this project will be looking into ways of improving release methods and the survival of the birds in the long term."